Digirad is a leader in the development, manufacture and distribution of solid-state medical imaging products and services for nuclear cardiology and general nuclear medicine applications. Digirad's forward thinking has enabled nuclear medicine and cardiology services to improve the quality of care and convenience for their patients, optimize patient management workflow and increase practice revenue potential. Digirad notably designed and commercialized the first solid-state gamma camera. By utilizing solid-state technology rather than bulky vacuum tubes, Digirad's imaging systems maintain image quality while offering significant advantages over vacuum tube-based systems, including increased mobility through reduced size and weight, enhanced operability and reliability, and improved patient comfort and utilization. The ERGO, a Large Field-of-view solid-state detector measuring 12.25 inches by 15.5 inches is Digirad's largest camera, with the capability to provide general imaging at the highest quality. 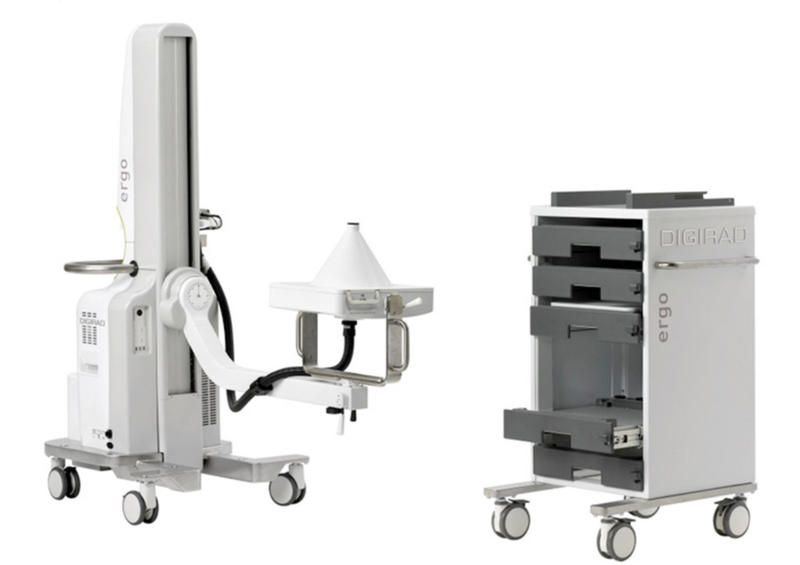 In addition to this, the Ergo boasts 3.25mm spatial resolution , more than 5Mcps count rate capability, and 7.9% energy resolution to make it the highest performing general nuclear medicine detector ever made.